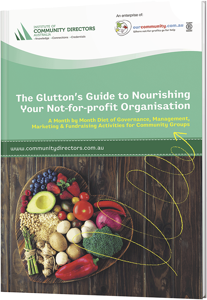 This book aims to help your organisation to plan its annual activities. But it's more than a dull roster of tasks you have to tick off to meet your bare minimum regulatory obligations. It's a year's worth of ideas, tips and resources designed to help you get the most out of your meetings, your activities and your people, much of it presented as easy-to-digest lists. For example, the March chapter brings a board review checklist; seven tips for grantseekers; seven free marketing methods; seven ways not to get robbed blind; and seven innovation drivers. Ultimately, all the activities are all aimed at helping your organisation to do one thing: to fulfil its mission. And the title? This is a book you can gorge yourself on. Bon appétit.